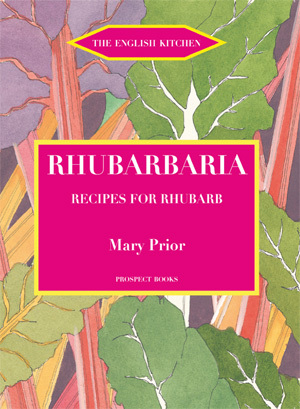 Mary Prior has compiled an anthology of recipes ancient and modern that highlight rhubarb. It first came to us as a medicine but has successfully naturalized as a culinary favourite. Drawing on the cuisines of England, Scotland, Scandinavia and other parts of northern Europe, America and New Zealand, she provides a rhubarbaric dish for every occasion. There is particular emphasis on recipes from Shetland, because the author spends half the year on the islands and rhubarb has a special place in Shetland’s cookery. From its home in the northern climes of Asia – Mongolia, Siberia and the foothills of the Himalayas – rhubarb came first to Europe in classical times as a dried root with medicinal qualities. Thus was it was initially proposed to a British public. ‘It purifieth the bloud and makes yong wenches look faire and cherry-like,’ says Gerard in his Herbal in 1597. It wasn’t until the 18th century that the fruit or vegetable was introduced to English tables. Mary Prior has undertaken an extensive search through earlier literature and presents here a commentated repertoire of every sort of rhubarb recipe. Whether with meat or fish, vegetables, as a pudding in its own right, as a jam or in chutney: all sorts of bright ideas are explained. Given that it is one of the few plants that every gardener can manage to harvest – slug-proof, drought-proof, flood-proof, the lot – that delectable tartness and fresh, roseate pink can ornament the tables of rich man and poor. Mary Prior is an historian who divides her time between Oxford and the Shetland Islands. Previously, she has published a history of the river-folk of Oxford. This is her first cookery book. See the first few chapters as a PDF. Rhubarbaria has been translated into French. This is the first translation that Prospect has done for some time. The publishers are Utovie and can be followed up athttp://www.utovie.com/.